It is a modern, harmless product with whitening effect. It removes age spots, freckles and post-pregnancy pigment spots. α + β – hydroxi-acids exfoliate stratum corneum cells, thus facilitating the penetration of whitening compound - ACHROMAXYL™, which inhibits the activity of tyrosinase in the process of melanogenesis. UV-filter ensures protection against harmful sunbeams and reduces pigmentation thus protecting the skin against photo-aging. 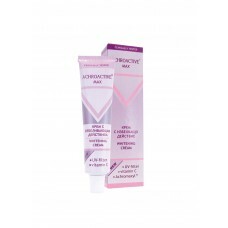 Recommended for use with the other series products ACHROACTIVE® Max – Whitening face mask and Intensive whitening serum. Application: The cream is applied twice a day: in the morning and in the evening. If applied constantly, the results are visible in 2-3 weeks. After 30 days the cream is applied before going out in the sun. In case irritation or reddening appears on sensitive skin, it is recommended to terminate the application of the cream for 4-5 days. After this period the cream is applied only in the evening and after another 4-5 days again in the morning and in the evening. Pierce the membrane with the back end of the cap!